Aerial view of the Christ, The Redeemer Monument and the Corcovado Mountain in Rio de Janeiro, Brazil. Many dream of experiencing Rio de Janeiro’s celebrated carnival or paying a general visit to this warm and atmospheric country. 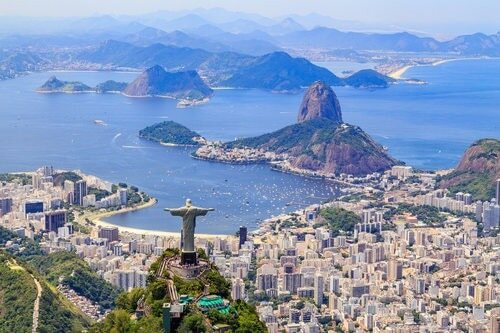 Full of contrasts and lively culture, Brazil will be sure to satisfy all visitor expectations. Displaying great emphasis on music, dance and mosaics, its diverse cultural influences make for a perfect touristic destination. Wilderness enthusiasts will be delighted to explore various national parks and the Amazon rainforest. For those seeking more of a relaxing stay, they will be able to do so on the 8000km stretches of beautiful coastline. For adventurous travellers, the Iguaçu Falls, the various climbing sites and Rio da Barra (for its paragliding and hang-gliding activities) are worth visiting. Brazil remains alive at night, so be sure to experience the nightlife at some point during your stay. Last Updated: April 10, 2019 8:48 ESTAssistance - removal of information about the closure of the Consulate General of Canada in Rio de Janeiro on April 9, 2019. Brazil is a popular destination for tourists seeking a change of scenery, yet sanitary conditions are not always ideal. Despite these conditions, it is possible to access good medical care in large cities such as São Paulo, Rio de Janeiro and Brasilia. There are 5900 hospitals in the country, 60% of which are private and located in urban areas. Popular with Americans and expatriates staying in the country, Hospital Israelita Albert Einstein in São Paulo, also established in Rio de Janeiro and Brasilia, offers a wide range of specialized services. In Rio de Janeiro, many hospitals provide quality care. For instance, the Samaritano Hospital specializes in cardiac care in addition to other specialized and basic care. Medical treatments are generally more expensive in Brazil. For emergency medical assistance, dial 192 or 55 11 2151-1233 to request private ambulance services from Hospital Israelita Albert Einstein in São Paulo. Risk Advisory – Is Brazil Safe for Travel? Both, a visa and a passport are required to enter Brazil. The passport must be valid for at least 6 months beyond the date of departure.